supports Time Machine backup, USB external storage backup and Rsync remote backup. provides Windows, Mac OS and mobile devices users with TNAS desktop applications and mobile applications. With green energy-saving design, the power consumption of F4-220 is only 17W in the operation status and just 2W in standby. POWERFUL HARDWARE: F4-220 runs the latest TOS 3 operation system, and adopts Intel Celeron 2.41GHz dual core CPU and is equipped with 2GB Ram (users upgradeable to total of 4GB) with high operation efficiency, several tasks of simultaneous processing as well as file read/write speed of more than 100MB/S. SUPPORTING DIVERSIFIED HARD DRIVES AND MULTIPLE RAID; F4-220 is compatible with 3.5 inch 12TB SATA hard drive and you can install 4 hard drives with total storage capacity of up to 48TB. It supports 3.5 inch SATA hard drive, 2.5 inch SATA hard drive and 2.5 inch SSD. F4-220 supports multiple RAID such as RAID 0, RAID 1, RAID 5, RAID 6, RAID 10, JBOD, SINGLE, thus it can provide various applications for users and guarantee more data security. VARIOUS SERVER APPLICATIONS; It supports file server, mail server, web server, media server, Rsync remote server, FTP server, MySQL server and other wide variety of server applications, to meet the common needs of small business customers. F4-220 supports Dropbox cloud synchronization, which can synchronize file in the Dropbox directory with TerraMaster TNAS, making file sharing more easy and efficient! DESIRABLE MULTIMEDIA SERVER; It supports DLNA/UPNP protocol and iTunes, Plex server, which can serve as home media server. The server streams the multimedia files through smart TV, set-top boxes or mobile devices. RELIABLE AND EFFICIENCY; As F4-220 adopts an aluminum-alloy shell and low-noise fans, it is solid and reliable with good heat dissipation and low noise. Due to the use of removable hard drive tray, it is easy to install the hard drive that also supports hot swap. If you have any questions about this product by TerraMaster, contact us by completing and submitting the form below. If you are looking for a specif part number, please include it with your message. 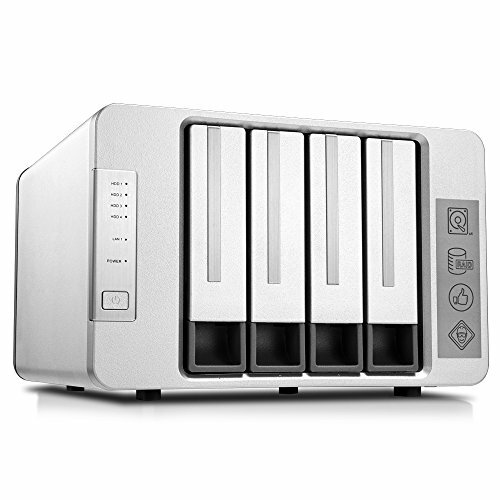 Qnap TS-453B-8G-US 4-Bay Professional-grade iSCSI NAS. Intel Celeron Apollo Lake J3455 Quad-core CPU with Hardware Encryption and exclusive USB type-C Quick Access Port.